· 2.4GHz control system: Ensures the strongest anti-interference performance and powerful signal. · 6 gyroscopic axes: strong stability, stronger wind resistance, easier to control. 3D rollover: fresh organic and exquisite action flight. · With LED lights: Makes it more dazzle beautiful and colorful night light. 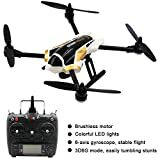 · Specifications: Brand: XK Model: X251 RC Quadcopter Frequency: 2.4G Channel: 4CH Gyro: Built-in 6 Axis Gyro Flying Time: About 12 minutes Charging Time: 60 - 80 minutes Control Distance: About 300m Motor: Brushless Motor Copter Battery: 7.4V 950mA Li-Po Battery Transmitter Battery: 6 x 1.5V AA Battery (Not Included) Product Size: 17.7 x 17.7 x 8.3cm Function: Up / Down, Forward / Backward, Turn Left / Right, 3D Stunt, Spin, con LED Light Specifications: Type: Quadcopter, RC Simulators Features: Radio Control Motor Type: Brushless Motor Functions: 3D rollover, forward/backward, Turn left/right, up/down, With light Built-in Gyro: Yes Level: Intermediate Level Age: Above 14 years old Remote Control: 2.4 GHz Wireless Remote Control Channel: 4-Channels Detailed Control Distance: About 300m Transmitter Power: 6 x 1.5V AA battery (not included) Model Power: 1 x Lithium battery (included) Flying Time: 10-13mins Product weight: 0.205 kg Package weight: 0.780 kg Product size (L x W x H): 17.70 x 17.70 x 8.30 cm / 6.97 x 6.97 x 3.27 inches Package size (L x W) x H): 22.00 x 30.00 x 31.00 cm / 8.66 x 11.81 x 12.2 inches Package Contents: 1 x RC Quadcopter, 1 x Transmitter, 1 x Charger, 4 x Blade, 1 x 7.4V 950mAh Lithium Battery, 2 x Landing Gear, 1 x English Manual, 1 x Balance Charger, 1 x Screwdriver, 1 x Key In order to ensure the product brand new and can work properlly, our staff will conduct product testing before shipment, so maybe the color box adhesive tape is opened.